We is much kyooter den doze boyz ennyway. AP’s liddlol famblee am SEW byootimuss! Inna kitchun maeking noms of korse!! Yu renember Screaming Yellow Zonkers!!!!!!!!!!! Congafredmcmurrays awn yr FP an nawt-sekkund AP! Well gyez, sorreh tu post-n-run, but ai wuz “hyred” lass-minnit tu du teh sownd ober at teh Pittsburg (CA!) Featur. Dey is duin M*A*S*H, adn ai has a rehursul tunyte. Wuz juss innerdoosed tu it yefferday, adn dey opinz tumorro! No preshur, tho. Ai can handlol it eezy. Awhlwais gud tu bee “hyred”. Ob korss, derz no pay, but mai repyootashun as teh “go-tu gye” hoo will gettin u fru eben at teh last minnit, shud get a littlol boost. Adn dats whut reely matturz. Dat pplz kno u will commin fru wen teh chips ar daon adn it hastu happin. Adn, ob korss, it feelz gud tu halpin mayk a gud sho sukseed. Yay fur teh arts! In Ottur noos, Ai haz a sad, Alex Karras crosst teh brij tudai. Wun uf teh few gentlolmanz lefted in shoe buzziness. Ai didnynt noe, hims wuz en Blazn Sadols! An hims wuz bery gud en Victor Victoreeah. Did manee tings en hims lyfe – Lottz uf talentz! 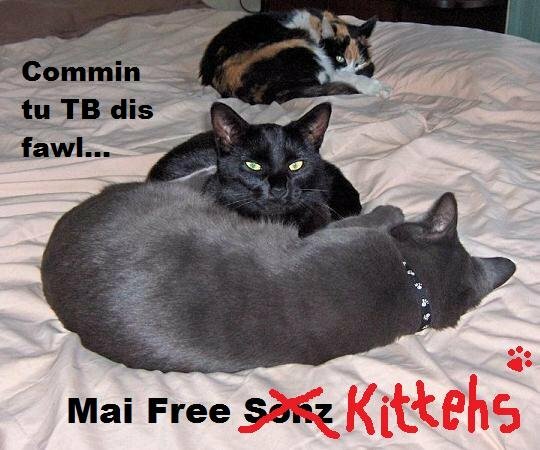 Did sum wun sai FREE kittehs?!!?? Aisle tayke wun! U can has teh minyunz. Dey wuz fun wen dey wuz littlol, but nao dey finks dey can taykin ober. Cyrano (aka Sir Skarfalot) eets awl teh fudz, adn Sofia hogz teh bed at nyte. Duz ennywun else hab taht theme song running thru dere haids rite naow? EERWURM!!! we am oald. ai kud just see it when yoo described it (wiff teh arms coming in frum eever side) adn now ai’ll be dreeming uv it when ai head tu bed! which iz now. g’nite, all!! O knoe, wee am knot oald! Jus bery whell edjumahkated en TVLand! Juss gettin bak frum duin sownd at M*A*S*H, ai has dat feem in mai hedd. I like the melody, but nawt the name or lyrics ob dat sawng. Yeh ai knoz, dats wye ai nawt menshunz dem. Teh play is moar lyke teh moobie den teh seriez, ykno. But eben still, is in teh middlol ob a war. Adn war is hell. Ai wishez warz nebber happind, but dey duz. And pplz suffurz. Better, aifinks, tu aknolidj adn unnerstand, den deny adn ignoar. Is tuff, but reel. Adn teh play showz bofe teh hyoomur adn teh horrur. may I please join in the cuddlefest? Aww, haow byootimus deez kittehs am.